My plan was to photograph Liam’s quilt today. The weather here is not cooperating with that plan. This same plan included taking the kids to the fair early and then throwing them into bed for naps while I completed said photography. Thus, my plan is no more. So I’ve distracted myself with photos that I took yesterday of one of my mostest favoritest things. I have a love/hate relationship with Hobby Lobby. Much like the other big craft stores. It’s easy to get distracted and overwhelmed as soon as you walk through the door, and I have a hard time focusing on the projects that are already on my table with so many shiny gadgets staring at me. That said, I love the 99 cent pattern sales and knowing that I can find a few basics. I’m not sure why it’s labeled “ribbon sachet”. (“Sachet” sounds to me like it should smell like fake-y flowers and it doesn’t smell like anything. Now that I’ve looked up the definition I guess it makes sense. It’s just not the first thing that comes to mind.) It’s 15 strips of ribbon in 2 yard lengths. 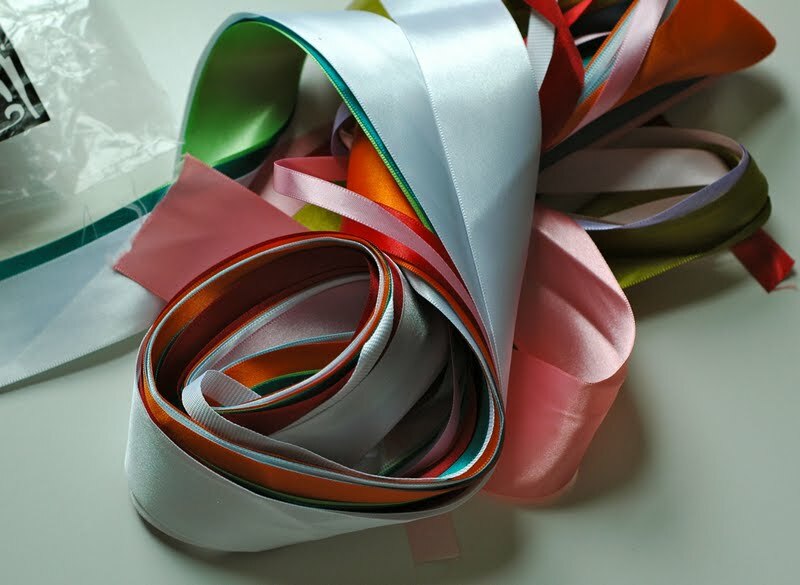 30 total yards, a mix of satin and grosgrain and sometimes a chiffon or lame is thrown in. Sometimes a stripe or print. Occasionally there’s been some lingerie elastic or wired ribbon in the mix. 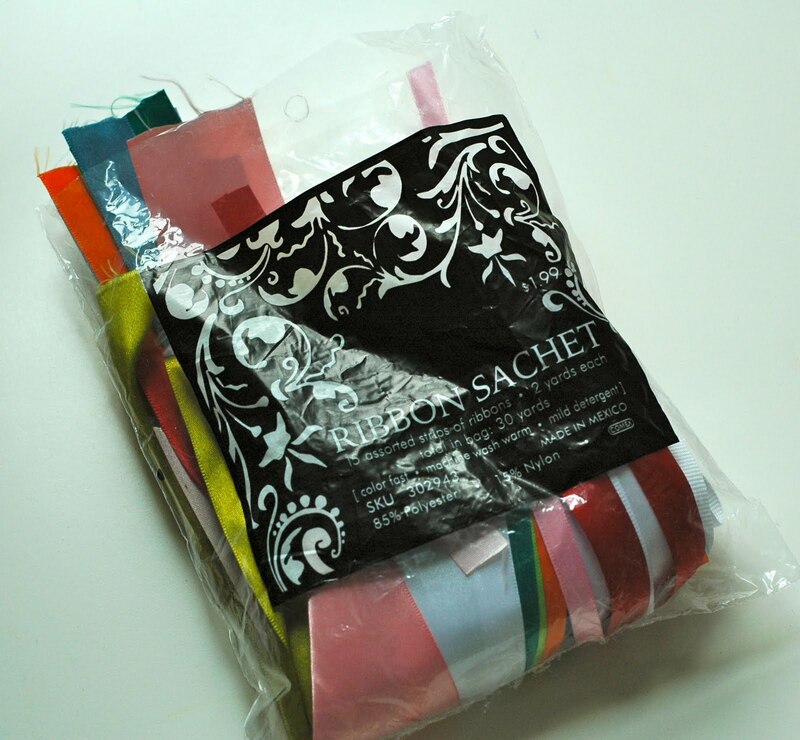 I’ve been buying these grab bags for years, from various stores, and a lot of my ribbon stash has come from these. I found these on the bottom shelf. Standing in the aisle with kids climbing on me, literally, I didn’t have a lot of time to squish them around and be picky about it. But for less than seven cents a yard, there’s not a lot of pressure. And at the rate K’s been raiding my stash for her own crafty projects and costume-making, I’ll be back for more next month. Are there really people out there that need to look for an excuse to go to Hobby Lobby? Personally, “It’s Monday (or whatever day it happens to be that day)” works for me! I want a Hobby Lobby!!! I’d love a sachet or two… or three. Hobby Lobby finally moved into our area 5 months ago. I have been waiting for three years! That’s how long the buying of land and planning and building has been in the works. Anywho!!! I remember my Granny buying these when I was younger but I honestly did not know that they were still available. Yay for Hobby Lobby AND YAY for the ribbon sachet! I have seen those but it’s hard to see in the packaging…..glad to know they are worth it! I have never noticed these but now I have a reason to go to HL. Another American craft store to love. 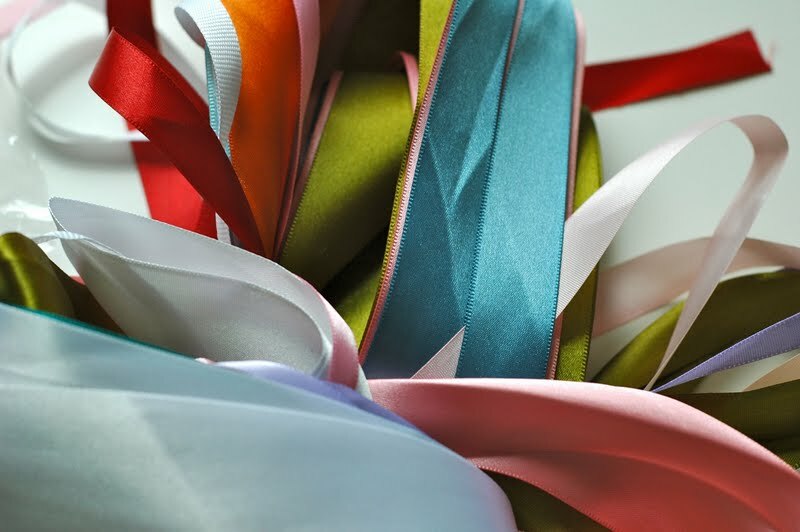 I never have the right ribbon for projects and get so overwhelmed by trying to buy ribbon on-line. Off to search and see if they’ve got a Hobby Lobby down here.